As a leading supplier and manufacturer of various paper manufacturing solutions and custom designed paper machines, Leizhan is capable to provide latest technology and services for kraft/tesliner paper board manufacturing system. Leizhan kraft/tesliner paper roll production system contains two sections: kraft/tesliner paper pulping system and kraft/tesliner paper making system. Machines required for Kraft/tesliner paper stock preparation line contains: Chain conveyor, D type hydrapulper, Dump pump, High density cleaner, Pulp chest/Agitator, Pulp pump for coarse screen, Mid consistency coarse screen, Single effect fiber separator, Reject separator, Mid density cleaner, Mid consistency fine screen, White water tank, Low density cleaner, etc. 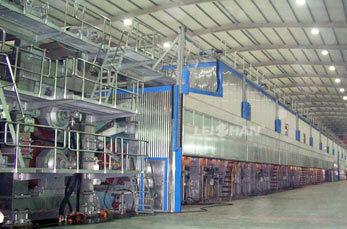 Leizhan Kraft/tesliner paper machinery has a basis weight range of 80-220g/m2 and a net width range of 1880-5800mm. It can produce 45-750 tons of high quality kraft/tesliner paper with the working speeds range of 150-800 m/min.